Tokyo is a lot of fun! Each time we've visited, we've always had a hilarious time partying in the gay bars of Shinjuku. The city is notorious for having over 300 tiny bars crammed together into a small space centred around Shinjuku's Ni-chōme (Area 2). 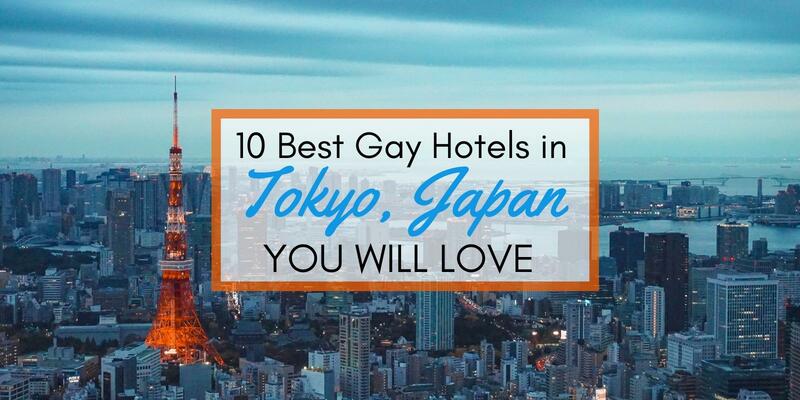 In terms of finding a place to stay, Tokyo has an array of gay friendly hotels to choose from. But be warned, whilst Tokyo is not as expensive as it used to be, hotels are not the cheapest here. Despite this, we've also managed to find a few gay friendly budget options to include in this list. Please note that while many of these hotels have lovely swimming pools and on-site spa and sauna areas, all travellers to Japan should be aware that if you have tattoos you may not be permitted in public bathing areas. While it's not likely that pools in hotels are being ‘policed', it's something to be mindful of and if you are really looking forward to swimming, maybe check the specific policy of the hotel before your trip. These are the 10 best gay hotels in Tokyo we loved, where we had no problems getting a double bed, and where we felt welcomed as a gay couple. Tokyo is a massive city so it can be daunting to try and figure out the best areas to stay, especially if it's your first time. 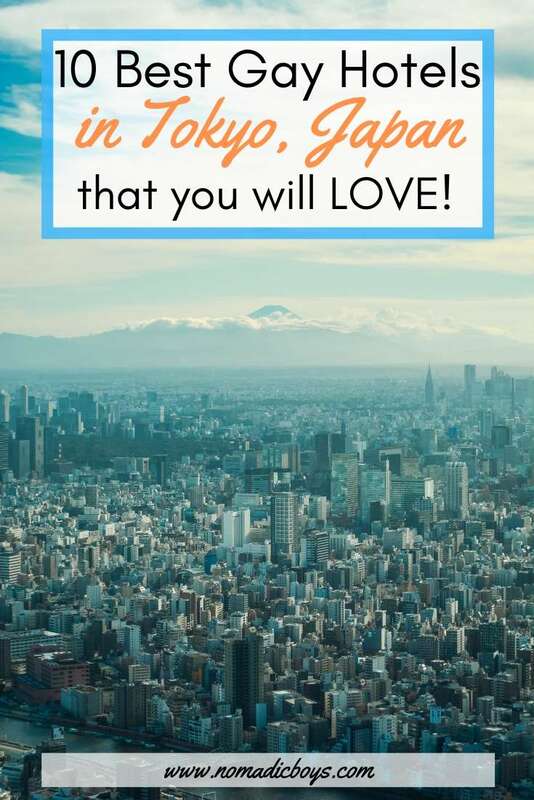 These are our thoughts on the best neighbourhoods to stay in Tokyo for gay travellers. Shinjuku: Shinjuku is our favourite part of Tokyo because it is the gay hub of the city! It's also a good area for tourists as there are lots of options for accommodation, shopping and entertainment. Being near the Shinjuku train station is especially handy since this is one of the busiest stations in the world, which means you will easily be able to get to other parts of the city from here. 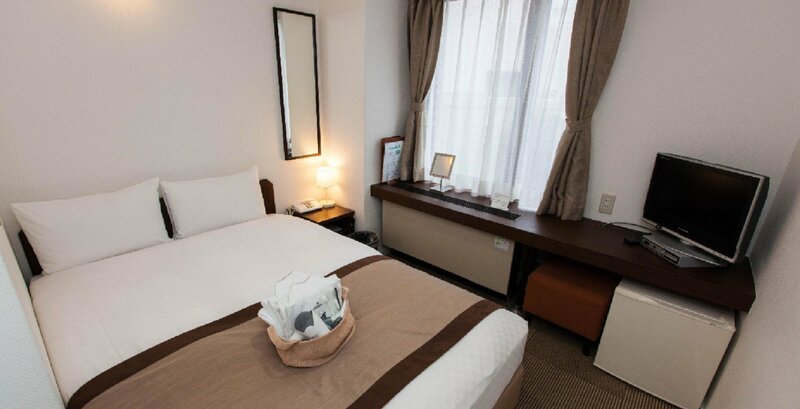 Our favourite gay friendly hotel to stay in Shinjuku is Keio Plaza. Akasaka: the area of Akasaka is also a very convenient location when it comes to public transport links. Being nestled between the Imperial Palace and Crown Prince's residence makes it perfect if you are planning to visit these attractions as well. 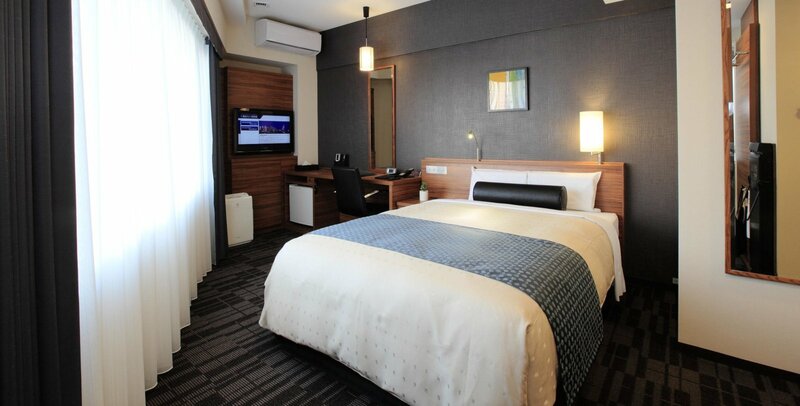 Our favourite gay friendly hotel to stay in Akasaka is The Capitol Hotel Tokyu. Ginza: Ginza is Tokyo's version of Fifth Avenue in New York with many modern Western-style buildings, some of Tokyo's most upscale shopping malls and lots of top-end luxury hotels. This is the place to stay if you are looking for luxury and the ability to shop up a storm! If you're looking to stay in this area, check out the quirky Ginza Bay Capsule Hotel. Asakusa: on the opposite scale to Ginza is the area of Asakusa which looks much more like what you might imagine ‘traditional Tokyo' to look like; before it was modernized and westernised. This is a great budget neighbourhood to stay in, especially if you'd like a quieter and more local experience. The area is also home to the National Sumo Stadium, so you may just spot chubby some sumo wrestlers during your trip! Wired Hotel is our favourite place to stay in Asakusa. Capitol Hotel Tokyu is our favourite place to stay in Tokyo. This the perfect retreat for couples or solo travellers who want to experience Japanese hospitality at its best. 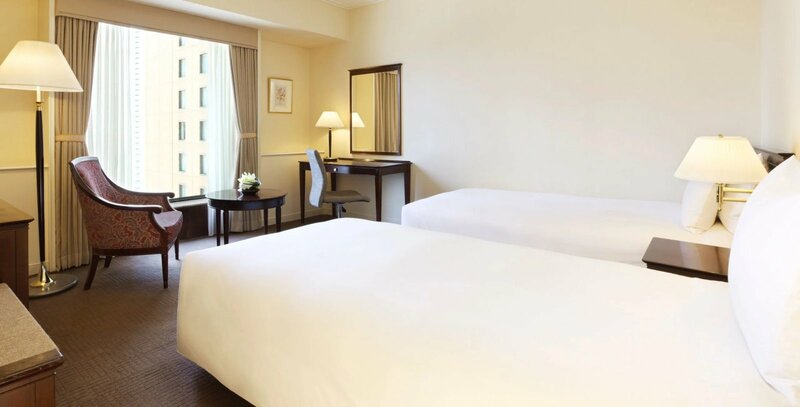 Conveniently located in Akasaka, downtown Tokyo, Capitol Tokyu is an oasis of calm in the hustle and bustle of the city. There are 4 subway lines directly under the hotel that you can reach from the basement level. Having access directly to the Tokyo Metro made our travels around the city very easy. Capitol Tokyu has three restaurants, boasting traditional Chinese and Japanese cuisine throughout the day, with the option to dine privately. We recommend the sushi at Suiren, located on the third floor. Our room was on the 25th floor, with a fantastic view facing the Imperial Palace and the concrete jungle below stretching as far as the eye could see. Make sure you check out their club lounge to enjoy a drink with a view! If you are looking for a budget option that's still in the heart of the action then Tokyu Stay Shinjuku is perfect. It's very close to the gay bars of Shinjuku and is located in a tower block, so the higher up your room is, the more impressive your views get. The rooms are a minimalist’s dream, fitted with white and light-wood furnishings. While it may not be as luxurious as some of the more expensive places, it is still impeccably clean. Most rooms include amenities like a washing machine and a dryer, a microwave or even a full kitchenette. The Tokyu Stay Shinjuku is only a five-minute walk from Shinjuku train station and is easy walking distance from nearby attractions such as the Robot Restaurant, the Shinjuku Gyoen National Garden, and the gay scene of Shinjuku Ni-Chome. The Keio Plaza Hotel takes its gay friendly reputation very seriously! Not only are the staff here extremely friendly and welcoming, they also offer LGBTQ travellers a “Pride Package” for their “Premier Grand” club floors. Keio is located in a skyscraper in Shinjuku, so as well as being close to the gay scene, the rooms have impressive sweeping views across the city. The huge tower complex boasts a fitness center, an outdoor sky-pool, a karaoke bar and a few other excellent bars. 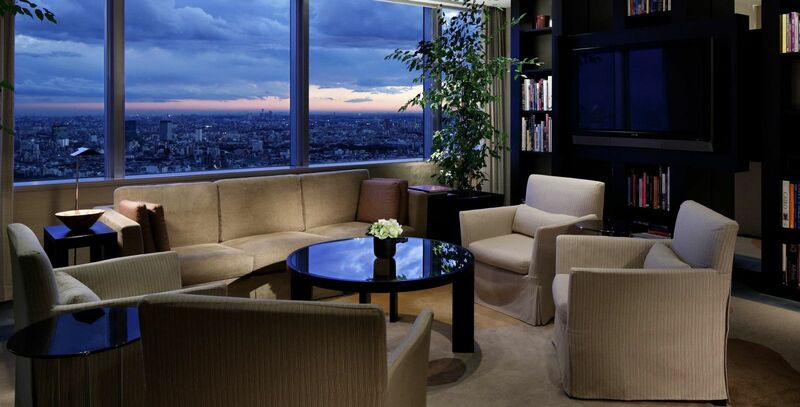 Make sure you try the Sky Lounge on the 45th floor, for the best views over Tokyo. We love the variety of restaurants, where you can choose to sample traditional Japanese dishes or even French and Italian cuisine. Keio Plaza is also a great place to pamper yourself; with an onsite esthetic salon (where you can have facials and other treatments), beauty studio and photography studio. For fans of Hello Kitty (like us), you can even stay in a Princess Kitty room, where everything is pink and Hello Kitty themed! And the cherry on the cake, there is a free shuttle available for guests to go to the Tokyo Disney Resort. Park Hyatt Tokyo is famous for being the place where the movie “Lost In Translation“ with Scarlett Johansson and Bill Murray was set. As well as being an impressive movie location, this is one of Tokyo's most luxurious and romantic hotels. Putting all Hollywood fantasies aside, the Park Hyatt is worth a visit just for the stunning city views. On a clear day, we could see the entire city skyline, all the way to Mount Fuji from our room! 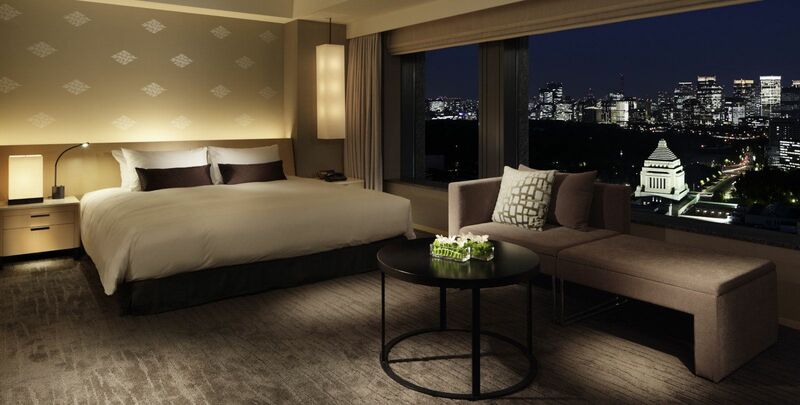 The rooms at Park Hyatt Tokyo are spacious and decorated with Hokkaido wood panelling. The beds are so comfy, you will not want to leave your room! The Park Hyatt has a large indoor pool, spa, fitness room and library. On the 52nd floor, check out their in house restaurant, the New York Grill & Bar, which offers 360-degree views. The in-house Peak Bar is also the perfect spot for a romantic evening cocktail, particularly at sunset. We found the vibe here to be especially open-minded and gay friendly. 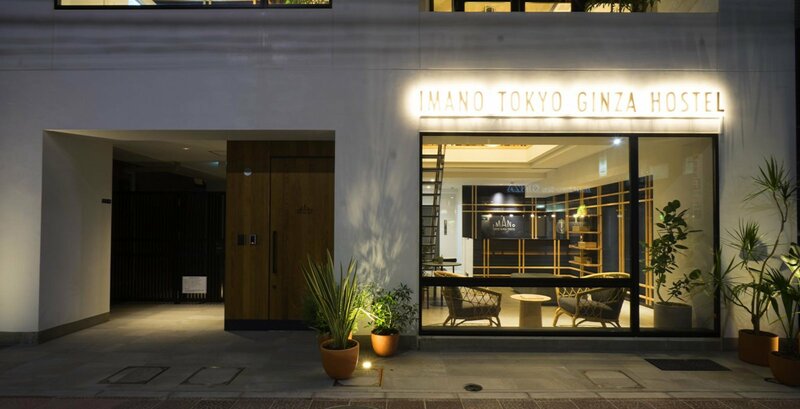 The Imano Hostel is ideal for budget travellers looking for a cool place to crash in the middle of Tokyo. Despite being a budget option, it also comes equipped with all the essentials like free WiFi, shower amenities, locker storage and even disposable slippers! You can choose to stay in a male-only or female-only dorm, a private family room (with four bunks) or even a Japanese-style room (with three futon-style beds). One of our favourite parts about the Imano Hostel is the coffee shop, where there's always a cool, chilled vibe with a mix of travellers and locals. Each floor also has a lounge area if you need to relax and not on a bunk. The friendly staff organise regular parties and happy hour in the café/bar. The Hyatt Regency: not a bad place to nurse a Shinjuku hangover! Our room here was the lap of luxury, with a stunning view of Tokyo. It's so lush that it makes you feel like you never want to leave Japan. As a massive bonus, this is an excellent base in the city, close to the main gay bars of Shinjuku. There are seven on-site restaurants, including ‘Cuisine[s] Michel Troisgros', the Japanese location for the 3 Michelin starred restaurant in France. 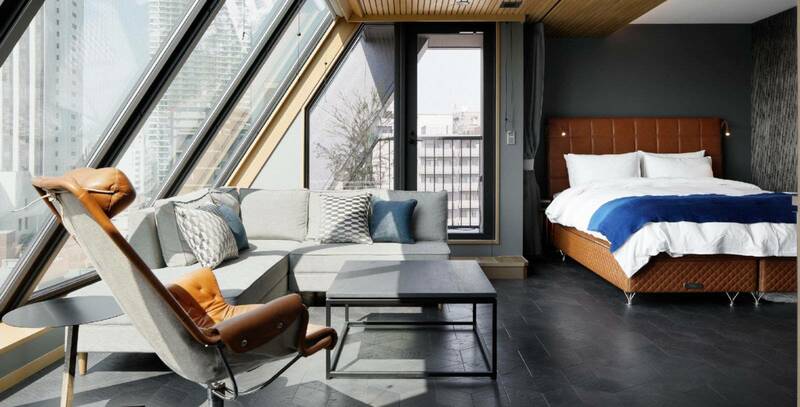 We loved the penthouse wellness sanctuary with its indoor pool under a skylight roof, the on-site fitness centre and the Joule Spa and Wellness facilities. The spa has a range of relaxing options available such as hot stone massages, facials and luxurious packages for when you want to feel really pampered! The concierge was on hand to assist with mapping out an itinerary for us, which was useful when looking for ideas and inspiration on where to head outside the city. Of all of the gay friendly accommodations we experienced in Tokyo, Wired Hotel may have been the most unique. The architecture and design of the place is the first thing that caught our eye. In addition, we loved the vibrant atmosphere on the ground floor where the hotel hosts community events in the café Zakbaran. When it comes to sleeping, there is a wide range of rooms and options, as Wired is part hotel, part hostel. There are gorgeous penthouse rooms, hostel-style dorms and almost everything in between! Due to the intimate nature of the place, we felt right at home and very welcome as a gay couple. We also loved the neighbourhood where the Wired Hotel is located because it's very residential, giving us a glimpse into local life away from the tourist hordes. 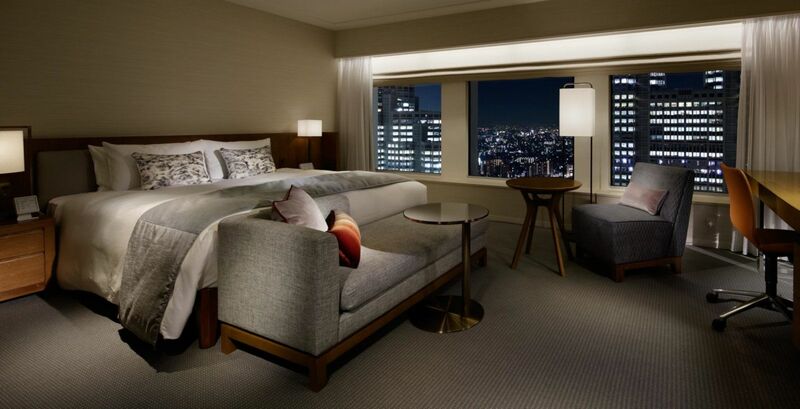 This three-star hotel makes our list of gay hotels in Tokyo due to its affordable pricing and generally friendly nature. The rooms here are simple, but if you're looking for a place with all the essentials in a great location in Tokyo, look no further. City Hotel Lonestar might seem pretty basic but if all you want is a clean and cosy place to rest your head then it's perfect, especially for budget conscious travellers who may not want to stay in a hostel. The low prices mean that there isn't a daily room cleaning service, however, you will be supplied with new towels and toiletries every day. City Hotel Lonestar offers room service, a hot tub, and complimentary continental breakfast. While some of the rooms are quite cosy, the cleanliness of the place far makes up for it. 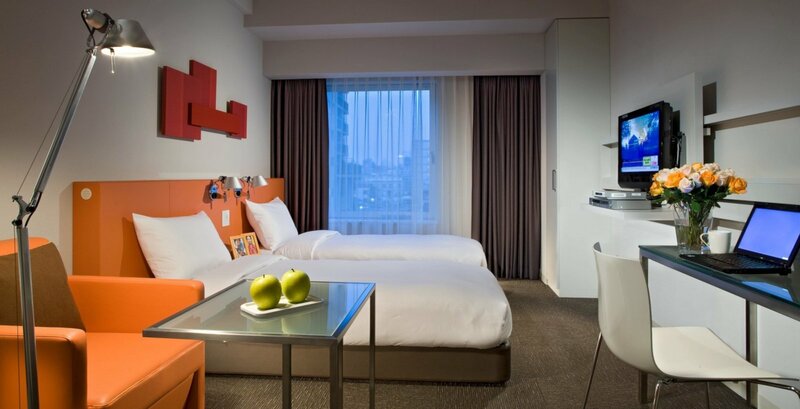 Citadines Shinjuku Hotel: all the colours of the rainbow! We think this place has a well deserved spot on our list of gay hotels in Tokyo because it boasts every colour of the rainbow…literally! From the blue and yellow exterior walls, to the bright orange furniture inside, this place has “fabulous” written all over it. But don't let the exotic colouring fool you as the Citadines has a 4-star rating for good reason. Citadines is an “apart'hotel” offering a range of serviced apartments with spacious living areas and well-equipped kitchenettes. The complex also features amenities such as a 24/7 fitness room, a breakfast lounge and 24/7 laundrette. The Citadines' close proximity to the Imperial Palace and National Garden was another major plus for us, as well as being near the gay area of Shinjuku. Ginza Bay Capsule Hotel: you have to try a capsule hotel at least once! The Tokyo Ginza Bay Hotel is a great place for budget travellers as it offers spacious pod-style bunks for quite low prices. The ultra-compact rooms/pods come with shared bathroom and lounge areas. The notorious “pods” are separated by gender, with men and women staying on different floors. Tokyo Ginza Bay Hotel is known for its professional staff as well as for its cleanliness, even in the common areas and shared bathrooms. Even though it's budget accommodation you still get complimentary toiletries, pyjamas, slippers and towels. Don't worry about being squashed in a bunk in a noisy dorm room either, the pods are roomy enough for a TV and the area is quiet. It's also located centrally within the city with easy access to the subway and within walking distance to Ginza's main shopping street. For something a little off the beaten path, check out this awesome gay owned mountain retreat on Airbnb. This is a gay owned hidden gem located in Hanno, which is around 70 minutes away from Shinjuku. Stewart and Tetsu are the British/Japanese gay couple who own and run Bunny and Bear. They are known for their warmth and hospitality, as well as their excellent cooking skills. The food here is fantastic! The traditional architecture of the home is stunning enough, with the ability to choose between a western style room or a traditional Japanese room. But what makes this place special is the location: it's surrounded by stunning mountains and foliage which, of course, are most spectacular during the leaf changing season in Autumn. 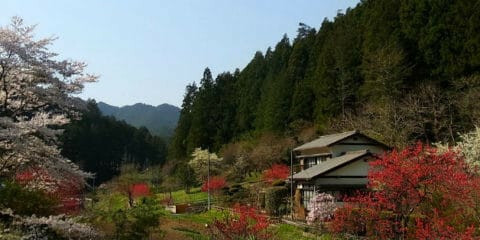 This spot in the mountains north of Tokyo is truly off-the-beaten-path. As it only accommodates up to five guests, you really feel like you're part of a family. If you're travelling outside of Tokyo, use our Japan itinerary article to help inspire and craft out your travels.